The Gene Larew 3.75" Punch Out Craw was designed for mat punching by pro angler Jacob Wheeler, this versatile lure can do a whole lot more than just slide and glide! Features seperate the arms and claws for a kicking, swimming action to benefit a multiude of rigging options. Pro Angler Jacob Wheeler designed this perfect punch bait with a sleek and smooth configuration so that it slips easily into the tiniest holds. 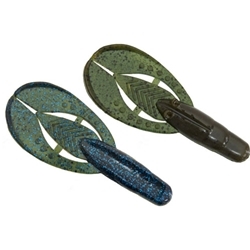 Its oversized flapper tail provides the ultimate glide performance!